Regional development is intrinsically related to the way in which the land is used. Given the rising awareness of the multifunctionality of the world's land resources, policy makers now face the complex task of accommodating multiple objectives of an increasing number of stakeholders in regional development. This implies a need for tools that can be employed to provide insights into the opportunities and limitations of land use. Those tools should be capable of quantifying trade-offs between socio-economic, sustainability, and environment-related policy objectives. 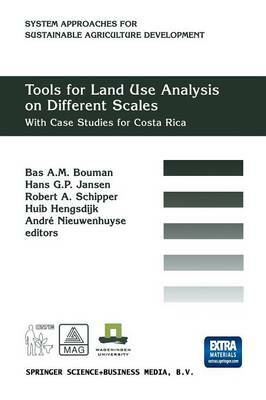 This book offers a detailed account of a range of interdisciplinary methodologies for land use analysis, developed over a twelve-year period (1986-1998) in Costa Rica, through collaborative research between three institutions: one from the North (Wageningen Agricultural University of The Netherlands), and two from the South (the Tropical Agricultural Research and Higher Education Center [CATIE] and the Ministry of Agriculture and Livestock [MAG]). The methodologies span a number of spatial scales, ranging from the field level all the way to the national level. Concepts of systems analysis and information technology play a pivotal role in each of the methodologies. Together, they form a unique toolbox that deserves ample use in the process of agricultural policy design.